We want to set the stage for good sleep habits so your baby can grow up knowing that bedtime is a safe, and peaceful time. Our sleep experts will provide support to you and your family, answering your questions and creating a customized plan to optimize your sleep and achieve overall balance in your life. Strategy packages peer-reviewed by certified doulas. Breastfeeding significantly helps to protect infants from death including deaths from SIDS/SUDI and from secondary disease and/or congenital conditions. Sheepskins or other fluffy material and especially bean bag mattresses should never be used. Infants should never sleep on couches or sofas – with or without adults. Both parents should agree and feel comfortable with the decision. Each bed-sharer should agree that he or she is equally responsible for the infant and acknowledge that the infant is present. Both parents should think of themselves as primary caregivers. Infants a year or less should not sleep with other children siblings. Persons on sedatives, medications or drugs, or who are intoxicated or excessively unable to arouse should not co-sleep on the same surface with the infant. 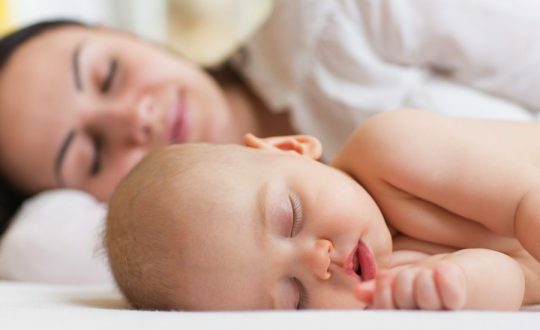 Extremely obese persons, who may not feel exactly where or how close their infant is, may wish to have the infant sleep alongside but on a different surface.